Bennett says he has great respect for Deputy Minister Litzman, but they have no political alliance regarding future coalition conditions. Jewish Home Chairman Naftali Bennett clarified today there is no political alliance between him and Deputy Health Minister Yaakov Litzman regarding a future coalition. 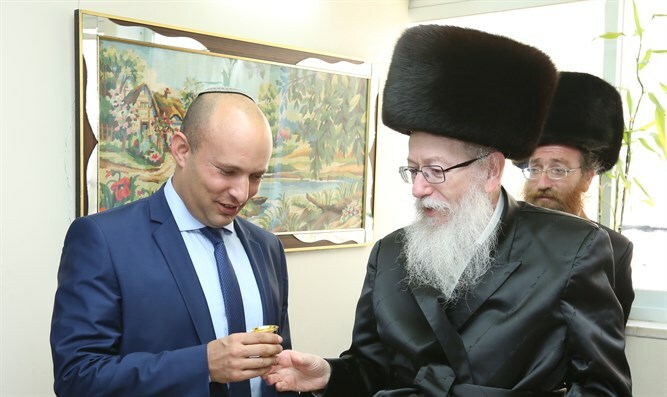 "I have great appreciation for Deputy Health Minister Yaakov Litzman, but there's no gentleman's agreement between us or any kind of understanding about joint entry into a future coalition," Bennett clarified in an interview with Kol B'rama radio. Recently, assessments have been published that Minister Bennett's excellent relations with Deputy Minister Litzman are based on a pact whereby UTJ and Jewish Home will not enter into a future coalition without the other. During the interview, Minister Bennett referred to the beginning of the academic year in the haredi sector and said that he intended to fight ethnic discrimination. "My goal is very clear: zero discrimination in educational institutions in Israel. There's no way that a child will be discriminated against solely because of his Sefardi background," he said.